Sensitivity to light (photophobia), an extremely common symptom among migraine sufferers, is a phenomenon whereby ambient light intensifies the headache and is one of the major diagnostic criteria for migraine. Though not as disabling as the headache itself, photophobia can be quite burdensome as patients halt fundamental daily tasks to seek the cover of darkness. New research now challenges the long-held assumption that aversion to light in migraineurs is solely related to sensory disturbances and contends that autonomic and emotional components of photophobia are also key contributors to the overall experience of migraine. New findings from researchers led by Rami Burstein, Beth Israel Deaconess Medical Center and Harvard Medical School, Boston, US, show that light triggers changes in autonomic function and produces fewer positive emotions in patients during a migraine attack. These clinical findings are complemented by basic science work demonstrating axonal convergence of retinal ganglion cells on hypothalamic neurons that project directly to regions that regulate sympathetic and parasympathetic functions. “Burstein and colleagues have once again nicely combined clinical studies with careful neuroanatomical mapping in rodents to provide new perspectives on photophobia associated with migraine. The results suggest that head pain is not the sole driver of light-induced discomfort in migraine,” said Andrew Russo, University of Iowa, Iowa City, US, who was not involved in the study. “In addition to mapping of neural pathways relevant to photophobia, the authors also spotlighted several neuropeptides and neurotransmitters that are positioned to modulate light-triggered autonomic responses in migraine,” Russo added. The findings were published online June 26 in Proceedings of the National Academy of Sciences USA. Interactions between visual and trigeminal nociceptor pathways are thought to underlie the phenomenon of photophobia. Indeed, previous work from the same group identified neurons in the posterior thalamus that were sensitive to dural nociceptor activation and were light sensitive, and whose axons projected widely over the layers of the somatosensory, visual, and associative cortices in rats (Noseda et al., 2010). These dura-/light-sensitive neurons were in close apposition to axons originating from predominantly photosensitive retinal ganglion cells, suggesting that exacerbation of headache by light is modulated by a retinal pathway that converges on dura-sensitive neurons in the thalamus. While the group’s previous work demonstrated how light exacerbates headache, long thought to be the principal driver of light avoidance in migraineurs (Drummond, 1986), the new study asked whether additional factors beyond pain might explain the aversion to light. The researchers recruited 81 migraine patients and 17 healthy controls. In order to characterize responses to light stimulation, the researchers exposed participants to light of various colors (white, blue, green, amber, and red) and intensities ranging from 1 to 100 candela per square metre (cd/m2, the standard unit of luminance; 100 cd/m2 is the typical brightness of a computer monitor) for 30 seconds of each. Patients were then asked to describe what they experienced while looking at the light. Patients completed the assessments either during an untreated migraine attack (ictal phase) or after being migraine free for at least three days (interictal phase). The investigators looked at four types of light-induced symptoms: hypothalamic-mediated autonomic symptoms including chest tightness, nausea, and light-headedness; hypothalamic-mediated non-autonomic symptoms including thirst, hunger, drowsiness, tiredness, or sleepiness; affective negative emotions including irritability, anger, nervousness, neediness, and sadness; and affective positive emotions including happiness, relaxation, calmness, and feeling soothed. Nonselective photic stimuli (that is, any of the five colors or intensities) produced greater autonomic responses in approximately 80 percent of migraine patients during the ictal phase compared with the interictal phase and healthy controls. This was also the case for selective photic stimuli (white, blue, green, amber or red, regardless of intensity). Alterations in hypothalamic non-autonomic responses were similar across all three groups, as was the case for affective negative responses, which in the latter case ranged from 55 percent of patients in the ictal group to 35 percent in the healthy control group (these differences were insignificant). But, interestingly, reports of photic stimuli-induced positive emotions were significantly higher in the healthy control group compared to both the ictal and interictal groups. Thus, somehow the migraineurs were experiencing fewer positive emotions in response to light. “Photophobia is much more complex than we originally thought. It contains not just a sensory component but also emotional and autonomic components that can be triggered by light and contribute to the whole experience of migraine,” said first author Rodrigo Noseda, Beth Israel Deaconess Medical Center and Harvard Medical School, Boston, US. In terms of color, blue, amber and red lights consistently produced a higher percentage of autonomic, non-autonomic, and affective negative responses across all three groups. But “green light was the only one to trigger positive emotions during migraine, which is something quite new,” said Noseda. This phenomenon may be related to previous findings suggesting that green light is analgesic (see PRF related news story and Noseda et al., 2016). To unearth possible neural pathways for the autonomic responses seen in response to light, Noseda and colleagues searched for convergence of retinal axons on hypothalamic neurons that project to key sites in the autonomic pathway. “The superior salivatory nucleus (SSN) in the brainstem and intermediolateral nucleus (IML) in the spinal cord are well known in the field of migraine and are believed to be key players in the autonomic symptoms of migraine and cluster headache,” Noseda told PRF. The researchers injected a recombinant adeno-associated viral vector encoding for green fluorescent protein (GFP) into the eyes of rats in order to label retinal afferents projecting to the hypothalamus, and used the retrograde tracer Fluoro-Gold to label hypothalamic neurons that project to the SSN and the IML. The researchers discovered that neurons that projected to either the SSN or the IML and received direct input from retinal ganglion cells were found primarily in discrete hypothalamic nuclei associated with sympathetic and parasympathetic functioning (the two branches of the autonomic nervous system). 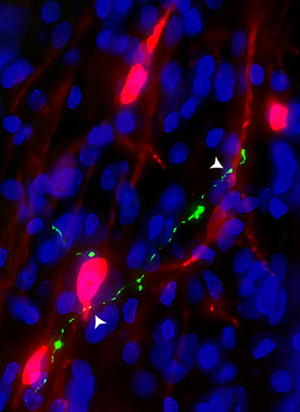 Moreover, immunofluorescence experiments indicated these hypothalamic nuclei contained a variety of neurotransmitters and neuropeptides that regulate mood, including dopamine, oxytocin, orexin, vasopressin, and melanin-concentrating hormone (MCH). “Not surprisingly, many of these neuropeptides and transmitters have been implicated in migraine from other studies, so this new link should further motivate the field to look into targeting them pharmacologically,” said Russo. Also for future research, Noseda said that along with confirming the current data, measurement of physical symptoms such as salivation, lacrimation (tear formation), bradycardia (slow heart rate), or tachycardia (fast heart rate) would add a physiological correlate to the patient reports. “The perception of a symptom could be objectively quantified to determine how much that symptom contributes to migraine photophobia,” said Noseda. “Another interesting question is whether there is a threshold of light intensity that is related to the activation of the autonomic system in this retinal-hypothalamic circuit,” Noseda added. For example, a light intensity of approximately 100-500 lux (similar to an overcast day) has been reported to cause discomfort in migraineurs (Vanagaite et al., 1997). Proc Natl Acad Sci U S A. 2017 Jul 11; 114(28):E5683-E5692. Light-induced discomfort and pain in migraine. A quantitative assessment of photophobia in migraine and tension headache. Migraine photophobia originating in cone-driven retinal pathways. A neural mechanism for exacerbation of headache by light.